There are two turquoise blue ones sitting on my kitchen counter. They've still got their original metal, twist-on caps. There's not a chip among them, and they're treasures in my culinary bits of jestam and flotsam. Old Mason jars. This particular brand of jar (along with Ball) took up much of my summers growing up on the farm. Hundreds of quarts of green beans and tomatoes and pickles went up into the cabinets on the back porch. You could keep track of what month it was by how full the jars were. As the year moved from summer to fall to winter then spring, the jars went from full and colorful to empty, clear and waiting for the next harvest season like an unfilled honeycomb. Those jars have been around a long time. Patented on Nov. 30, 1858, the Mason Jar is enjoying renewed relevance as our focus on eco-friendly, reusable materials continues to grow. Today, people are using the famous glass jars with the screw-on metal lids for everything from glassware, barware and serve ware to pencil holders, votive holders and vases. Mason Jars have also inspired a cult-like status as collectibles with collectors buying and selling them through antique stores and auction sites such as eBay. While most sell for just a few dollars, the rarest ones, including versions in amber, dark green, cobalt blue and black, have sold for as high as $30,000. In honor of the Mason Jar's 150th anniversary, Sweet Leaf Tea, one of the nation's fastest-growing beverage companies, is launching a new, limited edition (for the summer only) Blueberry Lemonade in an authentic, reusable and eco-friendly Mason Jar. The company will also be making its popular Peach Lemonade available in Mason Jars this summer. Today's lunch at The Star is all things dippable. As in chicken wings in blue cheese dressing. Chips and salsa. Then we've got some more exotic items. Right now there are two eggplant roasting over an open flame on the grill as the base for baba ghanoush, a Middle Eastern eggplant dip/spread. Another player from the Mediterranean: hummus, which is pureed chickpeas with some seasoning and sesame mixed in. I also put together the tomatillo salsa we had in Wednesday's Your Table, and it's a lot hotter than I'd imagined it to be. Reviews and recipes will come later on our favorites. Eric Asimov waxes poetically about ice cream drinks in today's New York Times. That naturally sparked conversation around the office that we need to have an ice cream drink day at The Star (Thursday is dip day. We'll let you know how it goes). Well, there's a root beer vodka out there, and its makers remind us that cool drinks in summer aren't just for kids: Three Olives Root Beer Vodka. And on to the cooking portion of our program. Which means that you're cooking with an element that is grainy, complex and has a bit of smoke already imbued in its innards. 1/4 cup Bourbon, 1/4 cup Soy Sauce,1/4 cup Dijon Mustard,1/4 cup Brown Sugar,1 small onion -- chopped fine,1/4 teaspoon Garlic powder, 1 dash Worcestershire Sauce. Mix and refrigerate. 1 cup bourbon, 1/2 stick melted butter, 1/4 cup brown sugar, 1/2 teaspoon crushed red pepper flakes. Brush on salmon and shrimp while they're grilling. It makes a lovely glaze. 1/4 cup apple cider vinegar; 1 tablespoon orange juice, 2 teaspoons coarse-ground prepared mustard; a pinch of onion powder; a tablespoon of brown sugar; 1/4 cup of bourbon; whisk well, then drizzle in and whisk 1 cup canola oil and a pinch of salt. Dress your salad at will. Beat eggs on medium speed, gradually add sugar. Add bourbon and condensed milk, mixing well. Add half & half. Pour into 1 gallon freezer, freeze according to manufacturer's directions. Garnish each serving with mint. I grew up in Bourbon country -- not Bourbon County, mind you. That's a misnamed patch of land north of Lexington that produces nary a drop of God's elixir. 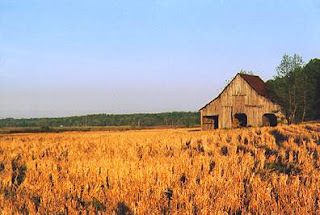 I'm talking Bourbon country, Nelson County, Kentucky, where the air in the fall is perfumed with the scent of fermenting mash and warehouses are stacked with barrels aging one of the world's manmade culinary arts. The picture (right) is borrowed from a cyclist's blog about a trip through Bourbon country. It really does look like that. This picture could have been taken from my bedroom window when I was growing up. Field trips in elementary school included the regular gamut: museums, the governor's mansion, the Louisville Zoo, Mammoth Cave. They also included a tour of the distilleries: Barton, Jim Beam, Maker's Mark. Good times. Good times. End travelogue. But if you want more information, there's a society in my hometown dedicated to Bourbon, the Bardstown Bourbon Society. Ever since I've been old enough to buy it legally, bourbon has been a favorite cooking ingredient. My first Christmas in town, I dropped off a box of bourbon balls (made with Evan Williams) at the Anniston Police Department. Heaven Hill is the best to marinate salmon and pork. Maker's Mark -- well, it's just plain good sippin' bourbon. It should come as no surprise then that others have discovered the earthy, bold flavor bourbon can give to food. Indeed, I prefer cooking with it to drinking it. There is little that is more American than apple pie, baseball, or cookouts. Since bourbon is a distinctly American product, it falls in line with this great tradition. While hosting outdoor cookouts this summer, serve well chilled versions of old-time favorites to your guests. Classic cocktails like the Manhattan, Old Fashioned and Mint Julep are ideal ways to accentuate the flavors of your barbeque with a top-notch American Whiskey cocktail. Texas’s Stubb’s Legendary Bar-B-Q in Austin pairs its barbeque with a signature Bourbon beverage like the refreshing Bourbon Swizzle or tart Bourbon Sour. One engaging way to impress your guests at an outdoor barbeque is to set up a tasting of American whiskeys, including both Bourbons and Tennessee Whiskeys. (Yes, you can include some of that Tennessee dreck, but why would you? Perhaps only to confirm bourbon's superiority?) Choose a selection of premium whiskeys and serve guests small (1/4 oz.) samples of each to compare taste profiles and discover pairing possibilities for your BBQ offerings. Bourbon’s popularity has also moved beyond the cocktail into the actual cooking, forging its way into sauces, marinades and even the grill itself. Scott Jensen of Stubb’s Legendary Bar-B-Q in Austin recommends grillers use bourbon-infused wood chips to add an extra bit of smooth and smoky flavor to their meats as they cook. “Since both Bourbon and barbeque use American woods to impart a unique natural flavor into their essence, the bourbon-soaked wood chips are a natural barbeque complement,” he said. When it comes to sauces, most major Bourbon brands already offer their own barbeque sauce; most are available in grocery or specialty stores. Stubb’s recently launched its own version: Stubb’s Hickory Bourbon Bar-B-Q Sauce. “Mixing the woody flavor of natural hickory smoke with the unique and savory notes of a Bourbon Whiskey brings two American classics together in a perfect sauce for bourbon-flavored barbeque,” Jensen said. Shake all ingredients except club soda in shaker with ice. Strain into Collins glass over cubed ice and add club soda...stir. Shake all ingredients except fruit in shaker with ice vigorously. Strain into rocks glass filled with cubes and garnish with orange slice and cherry. Mix ingredients together. Serve in a cocktail glass (4.5 oz) garnished with a lemon twist. Fill rocks glass with ice. Muddle orange slice with sugar and bitters. Add cherry, orange slice & lemon wedge. Top with splash of club soda. Whether it’s a poolside party or backyard barbecue, summertime is the perfect season for outdoor entertaining. While the mercury is rising, turn up the heat and flavor with grilling recipes made easy thanks to tips and recipes from Kevin Roberts, author of the new cookbook "Kissing in the Kitchen: Cooking with Passion" and the earlier, "Munchies." Roberts puts Frank’s RedHot on everything he barbeques; here are some tips and recipes sure to spice-up any summertime bash adapted from his cookbooks and the menu at his popular San Diego-based restaurant, East Village Tavern and Bowl. 1. BAKE wings in foil-lined pan at 500 on lowest oven rack for 20 to 25 min. until crispy, turning once. 2. TOSS wings in Buffalo Wing Sauce to coat. Alternate Cooking Directions: Deep-fry at 375°F for 10 min. Broil 6-inches from heat 15 to 20 min., turning once. Grill over medium heat 20 to 25 min., turning often. 1. MARINATE steaks in RedHot Sauce in deep dish. Cover and refrigerate 1 to 3 hours. Drain and season as desired. 2. GRILL steaks over high direct heat, about 15 min. for medium-rare, turning once. 3. LET steaks rest 10 min. before slicing. Splash on more RedHot Sauce to taste. Tip: Substitute other tender steaks such as boneless sirloin, flank or flat iron steak. Assemble the quesadillas ahead of time, then grill 'over drinks' just before serving. 1. Toss chicken with Buffalo Wing Sauce in bowl. 2. Layer chicken mixture and cheese on 4 tortillas, dividing evenly. Top each with second tortilla. 3. Cook about 3 to 5 minutes on an electric grill pan or barbecue grill until toasted and cheese melts. Cut into quarters to serve. Serve with blue cheese salad dressing and additional Buffalo Wing Sauce. Tip: You may substitute 1/3 cup Cayenne Pepper Sauce mixed with 3 Tbsp. melted butter. Looking for a fun Saturday activity that's close and dirt-grown cheap? Then the Downtown Farmers Market could be a place to check out. Apparently the produce and food products sold out quickly last weekend, so don't wait until 11:59 to show up and shop. Zinn Park is easy to find, and there's plenty of shade. After trying out several banana bread recipes for the last few years I finally found the one I love. I’ve made it several times and each time the loaves stick in the bottom middle of the pan. I do all the greasing with shortening and have tried using the non-stick spray, but still they stick. The top half of the loaf comes out great and tastes great. Eating the remainder of the loaf out of the pan is also fun. Who knew I could eat that much banana bread. So, if you get a gift of banana bread from me and it’s rather short, just remember that I ate the bottom half out of the pan, and gave you the pretty part. It's an ongoing (OK, recurring) element of discussion among our circle of friends that my children are ... unusual ... in their food habits. For whatever reason -- they hardly ever had cormmercially prepared baby food, I refused to be a short-order cook or eat chicken fingers for 876 straight days -- they'll pretty much eat anything that will work its way onto a plate. Every now and then, the 5-year-old will try to sneak something in and decree that she doesn't actually like it, but she's quickly called on her mini-power play and eats what's dished up. Summer means a lot of salads at our house. That means an array of leaf lettuces washed, chopped and always available in a big Tupperware container for whoever wants to grab a quick salad. Anyway, last night had salad as the main event. A little turkey, some boiled eggs, cheese, olives -- good stuff. I tell the children to pick out some dressing, to which the 8-year-old replies, with one shake of his head: "Nah. It gets in the way of the lettuce." Not since the night he objected to my putting a cheese sauce on his steamed cauliflower have I been so floored. I mean, who eats a salad DRY?!?! Turns out, a co-worker has a daughter about the same age who has started eating her salads plain in the last six months. Few ethnic foods get as much attention in this part of the country as Tex-Mex. Calhoun County has a slew of Mexican restaurants, and the grocery aisles indeed brim with the ingredients needed to make authentic fare from across the border. Bring on the fish taco, my friends. Here's a video showing you how. 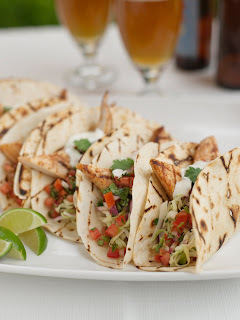 Fish tacos are among the most sought-after fare available from the abundance of marine life in the Sea of Cortez and the Pacific Ocean surrounding Baja, Mexico. While the inhabitants of Baja originated the idea, we can thank a U.S. college student who visited San Felipe on spring break for introducing them to us. Ralph Rubio fell in love at first bite and was able to get the recipe from the creator of his favorite fish taco. In 1983, Rubio began serving his own adaptation in San Diego. Today they are gaining popularity, and different variations—whether battered and fried or not—are popping up on menus across America. 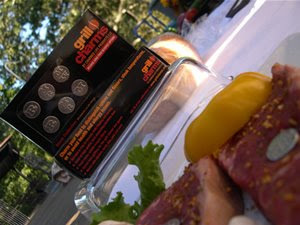 The Culinary Institute of America's chefs created the grilled version below that is perfect for an outdoor summer party. Preheat a gas grill to medium-high. If you are using a charcoal grill, build a fire and let it burn down until the coals are glowing red with a moderate coating of white ash. Spread the coals in an even bed. Clean the cooking grate. Cut the mahi-mahi into 16 equal slices. Combine the oil, lime juice, chili powder, cumin, coriander, garlic, and salt. Coat the mahi-mahi with the marinade. Grill the fish on the first side over direct heat until the flesh is firm and well-marked, about 2 minutes. Turn the fish and grill until cooked through, about 1 1/2 to 2 minutes more. Grill the tortillas until they have light grill marks and are heated through, about 15 seconds on the first side. Turn the tortillas and grill them until they just start to bubble, another 15 seconds. Center 2 pieces of grilled fish on each tortilla, and top with the Southwestern Slaw and Chipotle Pico de Gallo. Add a dollop of Mexican Crema, fold in half, and serve immediately. Combine all the ingredients. Allow the mixture to marinate for at least 30 minutes and up to 8 hours before serving. Combine all the ingredients and mix well. The pico de gallo is ready to use now or it can be stored in a covered container in the refrigerator for up to 2 days. Combine all the ingredients and mix well. The cream is ready to use now or it can be stored in a covered container in the refrigerator for up to 2 days. Note: If you cannot find Mexican sour cream at the store, substitute regular sour cream. Mexican sour cream has a milder acidic bite and a little more salt. How long to grill what? Be kind to the food you'll grill: It didn't do anything to you, so don't cook it into oblivion. Remember, a steak cooked "well done" is anything but done well. This time of year, people can't seem to get enough ideas for things to throw on the grill. Here's a suggestion of a spice blend, and an accompanying list of marinade ideas that come from using it. Most of the basic ingredients are pretty traditional, but they leave lots of room for culinary explanation. Among the twists: The honey pomegranate pork tenderloin (right) combined with summer vegetables will be a nice combination of spice and sweetness. Mix all ingredients until well blended. Store in tightly covered jar in cool, dry place. Makes enough for 2-3 marinade recipes. Start with 1 tablespoon of Super Spice Grill Blend. Choose one of our Marinades to prepare. Then, mix and match marinade with a pound of your meat, poultry or seafood choice. They're listed in order of which meats/seafood work best with a particular marinade. resealable plastic bag or glass dish. Add remaining marinade; turn to coat well. Remove meat, poultry or seafood from marinade. Discard any remaining marinade. Grill as directed on chart. Baste halfway through cook time with reserved marinade. I've always made my potato salad using red-skinned potatoes -- and leaving the skin on. They cook up beautifully and hold up nicely when tossed with other ingredients. You see distinct potato elements when you use the red potatoes. Nothing (OK, maybe Gene Simmons in a Speedo) is worse than potato salad that's mushy. Frankly, that kind of potato salad is nothing more than cold mashed potatoes all glumped together under the guise of mustard. Here's a recipe idea from the folks at McCormick, and while they're in the dried spice business, I'll bet this is even better made with fresh thyme and oregano. 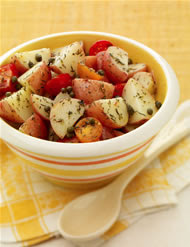 Be sure to toss the potatoes in the dressing while still warm so that they can absorb more of the aromatic flavor. simmer 10 minutes or until potatoes are fork-tender. Drain well. potatoes; toss to coat. Add tomatoes and capers; toss gently to coat. 3. Serve immediately or refrigerate until ready to serve. Pasta salad, too, can turn into a gelatinous mass. This one is bright, colorful and ready to hit the picnic circuit. Don't overcook the pasta, though, or it will turn into glue. Cook pasta as directed on package. Drain well. small bowl with wire whisk until well blended. and cheeses; toss to mix well. Serve warm or at room temperature. OK, this goes under the heading of something that, initially, seems frivolous but actually comes in handy, when you think about it: Grill Charms. They're the meat griller's version of those little wine charms that go around the stems of wine glasses to remind everyone whose glass is whose. These lightweight charms stick into a steak or burger before cooking to keep track of how each piece of meat will be cooked -- as well as what spices might go (or not go) on it. They'd also come in handy when some people have different dietary needs. A guest on a low-sodium diet probably needs to know which burgers have been drenched in Moore's or Dale's marinade. The really nice thing about these charms: There isn't a W for "well done." As any lover of meat knows, any steak cooked to "well done" is anything but done well. Local growers and back yard gardeners are flush with blueberries this season. The ones on my four bushes aren't quite ready yet, but that doesn't mean it's not time to start looking for ways to use these blue berries of happiness. We've got some classic blueberry recipes, as well as some flavor combinations you may not have tried. There are tips for picking the perfect watermelon and how to cook the perfect cut of rare roast beef. Trust me, it's an art few people in the South have mastered. Somehow everything called "roast beef" ends up being "pot roast." I love pot roast, but it's not a roasted hunk of meat that's taken a nice, hot vacation in the oven. There are also ideas for dips to enliven any party, and Ben Cunningham and Pat Kettles both talk about the hidden information on your adult beverage labels. Restaurant inspections tell you who's doing what in the dining scene, and Prudence Hilburn's Gourmet Touch takes waffles beyond breakfast. See Wedensday's Anniston Star for the complete lineup, including about two dozen recipes ideal for this hot, sultry season. As a family-run company that has passed down time-honored recipes for the past four generations, the makers of Smucker’s jams, jellies and preserves would like to help other families across the country keep their traditions and family-favorite recipes alive and encourage them to build new memories. To enter, share a family original recipe that incorporates at least ¼ cup of Smucker’s jams, jellies, preserves or fruit butter and the story behind how their recipe makes family celebrations special. The recipe must have been passed down for at least two generations. The top recipes will be posted on or about Sept. 8, 2008. Site visitors will be given the chance to vote to help determine one grand prize winner. Each of the contest finalists featured in the online vote will receive a Gift Basket of Smucker’s brand products. The grand prize family package for eight includes airfare, transportation to/from the airport, hotel accommodations for four nights, five-day Magic Your Way Tickets and commemorative Disney T-shirts and photos. Go online to get full details and complete official rules, to enter and to learn more about planning a memorable family gathering. Visitors to the site can find family reunion planning tips, a free downloadable family tree and Smucker’s jams, jellies and preserves recipes that will help them create the perfect meal from appetizers to entrées to desserts, every time, with a diverse range of jam, jelly and preserve flavors well-suited for any taste or occasion. Chipotle Mexican Grill will offer a new, limited-time burrito in honor of American cycling team, Slipstream-Chipotle, which will compete in the Tour de France in July. Called “Le Burrito,” it is made to meet the dietary needs of world-class athletes and will be featured in all Chipotle restaurants nationwide throughout the Tour de France, which runs from July 5 through July 27. Le Burrito is a Chipotle burrito filled with naturally raised chicken (from birds that are raised in a humane way, never given antibiotics or added hormones, and fed a pure vegetarian diet), black beans, cilantro lime rice, mild tomato salsa, and freshly made guacamole. This combination provides an energy-boosting ratio of 65 percent carbohydrates, 25 percent fat, and 15 percent protein that allows cyclists to perform at their best while racing. Le Burrito will be available at all Chipotle restaurants throughout the Tour de France. Flatbread is definitely not thin on taste. Do-Dah Day here at The Star on Thursday, and toasted flatbread will be ideal for hummus, baba ghanoush -- any hearty dip with lots of texture and tons of flavor. Certainly you can buy flatbread, but here's a way to make your own. A Cuban classic suited to the hot Carribbean, this recipe from "Cuban Home Cooking" uses everyday ingredients in unexpected ways. Remove skin and fat from chicken and sprinkle with salt and 1 teaspoon of garlic. In a large pot, brown the chicken in the oil over medium heat. Add the onion, and cook until it starts to brown. Add the remaining ingredients and enough water to cover the chicken pieces. Cook at a simmer, reducing the liquid until it's almost gone and the chicken almost begins to fry again. The Wienermobile will be in the 'Ham this week. A 27-foot-long hot dog is continuing a tradition started in 1936 (yes, the Wienermobile has been around since then) by Carl Mayer rolls on this summer. The Oscar Mayer Wienermobile will be arriving on Saturday, June 28th to help hot dog lovers actually become an Oscar Mayer Wiener. 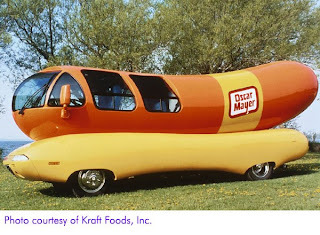 The Wienermobile is celebrating Oscar Mayer’s 125th anniversary. The celebration began in March with the unveiling of the Mini-Wienermobile and continued throughout June in Times Square when Oscar Mayer donated $100,000 to America’s Second Harvest, a food bank network aimed at supporting local communities. Oscar Mayer’s summer release of their beefier and juicier Premium Beef Franks has spiced up barbeques across the country, reminding Americans why hot dogs bring friends and families together around the grill. Drivers of the Wienermobile, also known as “Hotdoggers,” will help fans “relish” their experience by taking their pictures as an Oscar Mayer Wiener this weekend in Birmingham, McCalla and Moody (see schedule below). Hotdogger John Woodbridge says, “It’s great to see everyone smile as they tell us about their first memory seeing the Wienermobile, or seeing that first memory being created.” In addition, everyone who sees the Wienermobile will receive a Wienerwhistle, which has been an Oscar Mayer tradition since 1951. The Oscar Mayer Wienermobile has been spreading miles of smiles across America since 1936 when Carl Mayer, Oscar Mayer’s nephew, first introduced the Wienermobile. Everyone who sees the Wienermobile up close receives a world famous Oscar Mayer Wienerwhistle, which have been around since 1951. In 1963 Oscar Mayer created the “Oh I Wish” jingle which has been sprouting dreams of becoming an actual hot dog in the minds of consumers for more than 40 years. Now, in 2008 Oscar Mayer is celebrating their 125th anniversary. An idea that is bubbling up this summer: Americans are getting interested in enjoying freshly made soda and seltzer with a Soda-Club home soda maker. In seconds you can make virtually any flavor or amount of carbonated beverages, on demand, using nothing more than the water you drink today and a Soda-Club home soda maker. Soda-Club machines require no more countertop space than a coffeemaker and are even faster to use. Soda-Club USA, a newcomer to America, is a part of Soda-Club Enterprises, which has expanded to 18 countries on five continents since its establishment in 1991. Literally millions of fans around the world now make their carbonated sodas and seltzer daily using Soda-Club home soda makers and sodamix. 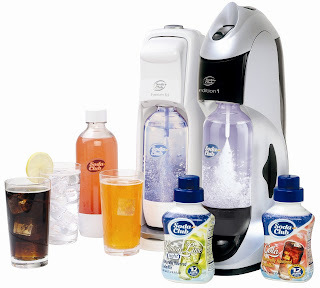 Making carbonated beverages with the Soda-Club soda maker couldn’t be easier. Simply fill the carbonating bottle with water, then screw it into the soda maker. By pressing on the unit’s top button, carbonation is injected into the water. Users can adjust the amount of carbonation to suit their preferences. Once carbonation is complete, simply unscrew the bottle. Soda-Club flavors run the full range of tastes, from classics like Root Beer and Lemon-Lime and mixers such as Ginger Ale and Tonic, to gourmet flavors including Pink Grapefruit, Cranberry-Raspberry, and Orange-Mango. Whichever flavor you create, the reusable carbonating bottles contain a special cap which helps preserve the fizz and flavor for days. “Believe it or not, Americans consume about 600 cans worth of soda for every adult and child in the United States,” states Meyer. According to the Environmental Protection Agency, that adds 10 1/2 cubic feet of packaging per American — over 3 billion cubic feet! — in our landfills and recycling facilities every year. Soda-Club carbonating bottles are reusable, and its sodamix flavors are highly concentrated, making them an environmentally-friendly alternative to canned and bottled soda. Many decades ago, in the damp chill of a Memphis December, The Birthday Cake was born. It was strawberry, that being the favorite flavor of the little fella the cake was intended for. There were strawberries in the batter, strawberries in the icing. For a boy, the dusky pink cake was a bold step, but strawberry it had to be, so strawberry it was. Years down the road, this particular recipe would vex a well-meaning young wife who, every December about a week before Christmas, would pull out the stained recipe card and try once again to duplicate Mother's result. It was - and likely this year again will be - a humbling experience, an annual quest to reach the mountaintop only to find you've somehow stalled on the slope far shy of the summit. There's something about boys and their mama's cakes. Cooking classes, multiple midnight attempts - even watching said cake being made one year - all fail in the category of aids to mimic The Birthday Cake. Maybe it's the connection brought about by washing skinned knees, explaining thunderstorms or putting just enough jelly on the peanut butter sandwich, but once a mama has made the cake, none other can compare in her boy's eyes. That's how it should be. Its creation is magic, something the two of you made in a time long before your boy makes the eventual discovery that his mommy really isn't the smartest, the prettiest or the funniest one in the land. It's a talisman you can revisit when, as a teen-ager, he's decided you need to drop him off at the end of the block instead of the front door at school. The annual ritual of making his cake can sweep you back to when he couldn't wait to point you out to all of his preschool friends - every day of the week. Having seen how the emotional value of a special cake only deepens with time, I decided my present for my own little fella this year would be his personal cake. About three months ago, our Saturday tinkering in the kitchen came around to the subject of cakes, what kind he liked (any) and what kind he loved (practically any). Not wanting to hear about it until late July, I didn't mention the "b" word, but I did start asking some questions about favorite cakes. Keeping in mind that a 2-year-old's tastes change as swiftly as the wind's direction, I have a list of flavors that kept popping up on his screen. Not so many Saturdays ago, the final version of his cake was set. Laced with orange juice, vanilla and a little almond flavoring, it's an easy, custom-made recipe that will become his birthday signature. When we make it this weekend, he'll lick the beaters and supervise from a chair as I pour it into the pans. He'll camp out in front of the oven, an arm wrapped around each dog, to watch his cake rise, turn golden brown and fill the kitchen with a delicate scent he'll - I hope - always associate with birthdays, happiness and home. So often I don't write recipes down, but this one will have its own card, one that will weather batter splatters, egg whites and many trips to the grocery. It will be in his mama's handwriting, and it will be his forever. Preheat oven to 350 degrees and grease and flour a 9-by-13-inch baking dish. Mix dry ingredients in a large bowl, then add remaining ingredients. Mix well, then pour into prepared pan. Bake about 45 minutes or until toothpick inserted in center comes out clean. Flip onto a wire rack and cool completely. Frost and decorate as you like. A general topping comes by melting a stick of butter, adding a small box of confectioner's sugar, ½ to 3/4 cup orange juice, then glazing the cake. For fancy birthday purposes, though, a good royal or buttercream icing will go well. Chicken breasts can be grilled with or without the skin on, but will be juicier if cooked with skin on. Remove skin after cooking to lower total calorie and fat content. From the National Chicken Council and the U.S. Poultry & Egg Association, here are two new chicken grilling recipes to try during the hot summer months. This works well as an appetizer or an entrée that adults and kids both will enjoy. Start by marinating chicken tenderloins in a mixture of garlic, cumin, chili powder, paprika, brown sugar, cilantro, salt and coconut milk. Then thread onto bamboo skewers that have been soaked in water. Grill the skewers while making the mango-flavored dipping sauce by reducing mango nectar with Asian spices. Serve over rice and with a summer green vegetable like zucchini for an entrée, or pile skewers on a platter to serve as appetizers. In large bowl, combine minced garlic, cumin, chili powder, paprika, 2 teaspoons brown sugar, ¼ cup chopped cilantro, 1 ½ teaspoons kosher salt and lite coconut milk. Stir well to blend. Add chicken tenderloins, toss to coat, and marinate in refrigerator for 2 hours or overnight. Prepare gas or charcoal grill. In medium saucepan over medium-high heat, warm olive oil. Add scallions and jalapeno; sauté until barely translucent, about 2 minutes. Add mango nectar, 1 tablespoon brown sugar, allspice, lime juice and ½ teaspoon kosher; bring to a boil over high heat. Reduce heat to medium-high and simmer sauce about 20 minutes, until thickened and reduced by half. Cool; stir in 2 tablespoons chopped cilantro and mint. Set aside. Thread one piece of chicken tenderloin onto a wooden skewer that has been soaked in water. Repeat until all pieces are threaded. Place on grill and cook about 3 – 4 minutes per side, turning once, until cooked through. 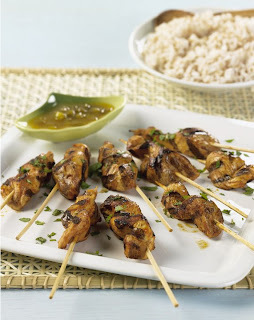 Serve skewered chicken with Hot and Sour Mango Dip. This light summer recipe is full of the flavors of summer. Start by blanching romaine lettuce leaves in boiling and then ice water. Then combine ground chicken with garlic, Italian seasonings and salt; form the mixture into balls and place on top of each lettuce leaf, along with a slice of Fontina cheese and a basil leaf. Roll the lettuce leaves into round packages; secure with wooden toothpicks and place on the grill. 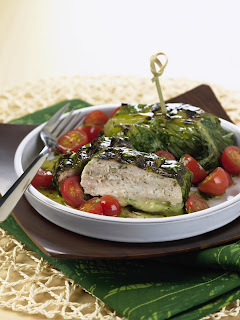 Serve the chicken parcels with a vinaigrette dressing of olive oil, balsamic vinegar, chopped basil and halved grape tomatoes. Bring a large pot of water to a boil. Fill a large bowl with water and ice. Using tongs, blanch the romaine lettuce leaves by plunging them, one by one, into the boiling water for 2 – 3 seconds each, then placing in ice bath. When all leaves are blanched, spread out to dry on paper towels. In large bowl, combine ground chicken, garlic, Italian seasoning, 1 teaspoon kosher salt and ½ teaspoon black pepper. Place one romaine lettuce leaf on flat surface; top with basil leaf. Add 3 tablespoons of the chicken mixture and a slice of Fontina cheese. Fold leaf bottom in, then the sides up, and finally the top down, so that filling is completely enclosed. Use two wooden toothpicks to hold the parcel together; set aside. Repeat procedure until 12 parcels are formed. In medium bowl, whisk together extra-virgin olive oil, vinegar, ½ teaspoon kosher salt and ¼ teaspoon black pepper. Stir in chopped basil and tomato halves. Brush parcels with 1 tablespoon olive oil and place on grill. Cook for 6 minutes; turn and cook other side for additional 6 minutes or until chicken is completely cook through. 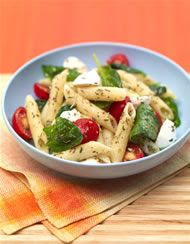 Serve with spoonful of tomato-basil vinaigrette. Fourth of July is on the way and whether it's a small affair with the family or a huge backyard bash, everyone will be barbecuing. While burgers and steaks will be sizzling on the grill, readers may also be tempted by out-of-the-ordinary salads and desserts that cook well with the kiss of flame. 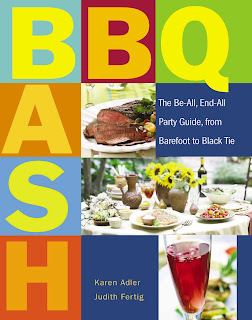 Karen Adler & Judith Fertig, from their recently released summer grilling book BBQ Bash: The Be-All, End-All Party Guide, From Barefoot to Blacktie (April 2008, The Harvard Common Press), have a few suggestions. Colorful, tasty, and easy to prepare with their straightforward instructions, these recipes allow cooks to spend more time at the grill, instead of running back and forth to the kitchen to get other dishes prepared. As a side dish to serve with grilled chicken, fish, or steak or as a summery meal on its own, we love this version of the traditional Greek salad. The romaine lettuce and red onion sizzle on the grill for extra flavor. Make this when summer tomatoes are at their peak. To make the vinaigrette, whisk all the ingredients together in a small bowl. Set aside. Thread the skewers with the onion slices so that they look like large lollipops. Cut the hearts of romaine in half lengthwise. Brush the onion slices and the romaine halves with olive oil. Grill the onion slices for about 5 minutes per side, or until blistered. Grill the romaine, cut side down, for 1 to 2 minutes, or until the lettuce has browned. Chop the romaine and onion and arrange on a serving platter. Top with the cucumbers, tomatoes, feta, and olives. Drizzle the dressing over the top and serve. This easy, refreshing, and colorful salad looks and tastes great. Grilling the citrus fruit adds just a touch of caramelization and makes the fruit even juicier. And the aroma? Fabulous! To make the dressing, whisk all the ingredients together in a small bowl; set aside. 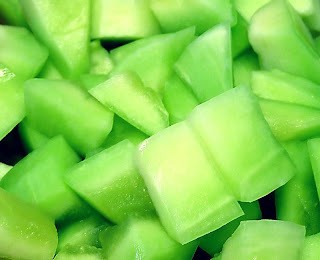 Trim the ends off the fruit (but do not peel), then slice into 1/2-inch-thick slices. 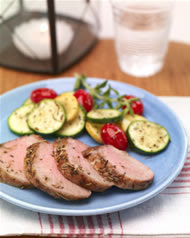 Brush the slices with olive oil and grill for 1 minute on each side, or until slightly browned. Arrange the slices on a platter and top with the avocado. Pour the dressing over all and serve immediately. Who says dessert has to be difficult? This one is chic, but oh so easy. Karen remembers a delicious breakfast in Belgium with chocolate sprinkled on homemade buttered bread. Similar to s'mores, but not quite as messy, this is a grownup version for the grill. Serve with a bowl of juicy ripe strawberries. Prepare a medium-hot fire in the grill. Slice off the ends of the bread and then slice the bread on the diagonal 1/2-inch thick, to get 16 slices. Break or cut the chocolate into 16 pieces. Place bread, chocolate, oil, and salt on a baking sheet and carry out to the grill. Drizzle the bread with a little bit of olive oil and place over the fire to toast (1 to 2 minutes). Turn bread over and place on the indirect-heat side of the grill. Place a piece of chocolate on each slice of bread. Close the grill lid and let heat for a couple of minutes. Remove the crostini from the grill and set on a serving dish. Sprinkle with a tiny bit of salt and devour while warm. Friday is the deadline to enter the Marx Foods wild salmon recipe contest. To see what other contestants have submitted, take a look. Recipes must be submitted by midnight, Pacific Coast time, Friday. What's in that frozen dinner? They're praised for their convenience, and some of them taste better than what a lot of people can cook, but what's in that frozen dinner, anyway? WebMD asked that question in an interesting story that looks inside the ingredient lists and checks on some common additives in frozen dinners. Food allergies: Are hospitals prepared? New research findings suggest that some food-allergic children may not be equipped with enough potentially life-saving medication to reverse a severe allergic reaction. According to research to be published in an upcoming issue of the Journal of Allergy and Clinical Immunology, a second dose of epinephrine – the drug of choice for treating severe allergic reactions – was needed in nearly 1-of-5 cases of food-induced anaphylaxis in children. Nearly all patients who required multiple doses of epinephrine also suffered from asthma. Though further studies are needed, these findings point to asthma as a risk factor for severe anaphylaxis and could influence how epinephrine is prescribed to children. Many children and adults at risk of severe allergic reactions are currently advised to carry only a single epinephrine auto-injector, which is administered when a severe reaction occurs. Järvinen and colleagues from Mount Sinai School of Medicine studied the histories of 413 food-allergic children. They identified 78 patients who had received epinephrine to treat a total of 95 anaphylactic reactions. Parents of the children were asked to recall the suspected food trigger, how rapidly symptoms developed and the timing of treatment. Of the 95 reactions treated with epinephrine, a second dose of the medication was administered in 19 percent of cases (18 patients). A third dose was required in 6 percent of cases (6 cases). Of those who received multiple doses, all but one (94 percent) were also diagnosed with asthma. In a surprise finding, the survey results also indicated that many children did not receive epinephrine, despite past severe reactions. While 51 percent of total patients studied reported a past history of anaphylactic symptoms, only 20 percent had ever used epinephrine. Anaphylaxis is a serious, potentially life-threatening allergic reaction that can affect the cardiovascular, respiratory or gastrointestinal systems of the body. An estimated 100-150 people in the United States die each year from anaphylaxis, according to the American Academy of Allergy, Asthma & Immunology (AAAAI). Anaphylaxis is most commonly caused by allergic reactions to food, insect stings and medication. Food allergies affect 3 million American children, including 1 in 17 children under the age of 3, according to the AAAAI. Additionally, about 9 million children in the United States have asthma. Last year was a drought year in so many ways. One in particular: The blueberry bushes next to my woods were definitely closed for repairs. Well, they seem to be making up for it this year. Although we're about three days away from being able to go pick breakfast, the bushes are laden with fat, plump berries that have managed to hang below the birds' radars thus far. A few growers have also called and said this will be a bumper year. Blueberries are one of those so-called superfoods: incredibly good for you. They're also easy to freeze, fix or, as my son says, just stand under the bush and start eating. This makes use of fresh oregano, but don't be afraid to try it with dried oregano leaves. The mangoes looked great in the store yesterday(Sunday), so give this a go for a tropical twist. This serves 2 as a dinner portion. 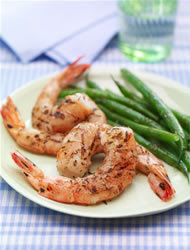 It's easier if you have a grill basked to cook the shrimp, because they turn pink and curl when they're cooked. You're less likely to overcook them that way. But skewer them if you want to; just be careful not to cook them more than 6 minutes total, or they'll be little rubber doorstops. Mix in a glass bowl. Cover and chill about an hour (longer if you're using dried oregano). 24 medium-sized shrimp, peeled and deveined, but with the tails still on. Mix in a gallon-sized zip-top bag and set aside for about 15 minutes. Either skewer the shrimp, or put them in a grill basket. Cook over a hot grill about 3 minutes per side or until the shrimp turn pink and start to curl. Serve tossed with the salsa. This is a tale of two food scientists. One was developing a new soy yogurt and the other a new coconut milk ice cream. Together, almost by accident, they created something completely new: coconut milk yogurt. 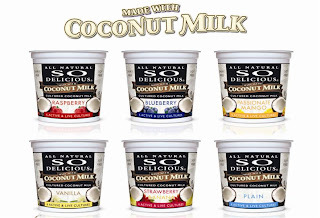 Their creation, So Delicious Coconut Milk Yogurt, is being launched this summer by Turtle Mountain, makers of America’s most popular dairy-free ice creams and frozen desserts. The new yogurt is made by adding beneficial bacteria cultures to organic coconut milk. Six live and active cultures turn the naturally sweet coconut milk into a thick and creamy yogurt. The two scientists, Ken Viscidi and Dolly Mok, were working on their separate products when they decided to mix things up by adding the yogurt culture to the coconut milk. The results surprised and excited them and they knew immediately they had created something special. “Even after the first try it tasted great. We knew we were on to something,” says Ken. The new yogurt is 100% soy and dairy free and fortified to be an excellent source of calcium, magnesium and vitamin B12, an essential vitamin many vegetarians have trouble getting enough of. Since it’s made with coconut milk, the yogurt contains medium chain fatty acids (MCFAs) such as lauric acid which are known to boost the immune system and thyroid function. So Delicious Coconut Milk Yogurt is available in six flavors: Plain, Blueberry, Raspberry, Vanilla, Strawberry Banana and Passionate Mango. The suggested retail price is $1.89 for a 6-ounce container and it will be available at Whole Foods Markets and other select grocery stores nationwide in early July. Turtle Mountain is based in Eugene, Ore., since 1990. All products are 100% plant-based and contain no artificial sweeteners, trans-fats or hydrogenated oils. Most are made with certified organic ingredients. But they are supposed to contain tons of antioxidants and nutrients to make your body work better. thinkproducts one of the nation’s largest producers of nutrition bars, is pleased to announce the launch of a superfruit bar, thinkFruit. With recent studies championing superfruits, several thousand superfruit products are expected to enter the market in the coming year. think Fruit has a reduced-fat bar that incorporates the flavors of pomegranate, acai, goji berry and noni fruit, along with high-protein ingredients such as dates, cashews, peanuts and almonds. thinkFruit is not only an immunity booster and a good source of fiber, but is also soy and gluten free. With less fat than the average fruit and nut snack bar, thinkFruit comes in four delicious flavors; Chocolate Pomegranate Power, Cashew Acai Protect, Peanut Goji Glow and Apple Noni Nourish. thinkFruit will be available in local retailers across the United States for $1.29 and online beginning July 2008. Just how much ARE we eating? To the uninitiated, calorie counting may seem like a simple matter of adding up a few numbers and hey presto, you have the total day's calories in an instant. Studies show that it's easy to underestimate our food calories by as much as 600 calories per day – and that as many as 80 percent of women and 60 percent of men underestimate their calories. What's more, the heavier you are, the more calories you are likely to underestimate. Underestimating the portion or serving size. It's surprising just how small a standard 8 fl. oz. cup can look next to large containers holding anything up to 32 fl. oz. And with 12 fl. oz. glass sizes being the norm, it is easy to mistakenly treat it as a 1-cup serving instead of one-and-a-half cups. And those 20 fl. oz. bottles in take-out food outlets contain two-and-one-half cups. Similarly with weights, we don't realize that what may look like a 3 oz. muffin can actually weigh 5 to 6 oz. We're not good at judging weights of foods – and even dietitians have to have the trusty food scales close by. Forgetting to include calories from drinks such as fruit juice, milk, coffee with sugar and/or milk/cream, soft drinks, sweetened iced tea, energy drinks, alcoholic drinks. Even when one believes they are eating sensibly, calorie-laden fluids can easily account for 50% or more of total calories for the day - particularly when they are freely imbibed to quench one's thirst instead of water. And don't forget to count the 2-3 teaspoons of sugar that might be added to your 6 or more cups of coffee throughout the day. Twelve heaping teaspoons of sugar add up to some 300 calories! Mindless eating such as might occur in front of the TV or computer, where you keep nibbling at the contents of a large package of snack food or dipping into the ice-cream container. It's easy to lose track of the actual quantity of food consumed. Even more so with drinks that you consume throughout the day whether sweetened coffee with loads of half-and-half, or glasses of soda, fruit juice or other calorie-laden drinks – particularly when thirsty and not quenching one's thirst with water or other calorie-free drinks. Misunderstanding serving size on the label. For example, not realizing that the serving size stated on the label does not apply to the contents of the total package – particularly where single-serving snacks and drinks are shown as containing 2 servings. Being fooled or trusting that label claims such as "low fat" or "low carbohydrate" on a menu or product label mean "low calorie" and that larger portions can be eaten. Other terms that can easily mislead include "fat free", "zero trans fat", "low GI", "baked". Ultimately, it's the serving size that determines the total calories. Being fooled by menu descriptions that usually hide loads of fat and calories. Examples include: Au gratin, carbonara, creamy/creamed, sautéed, pesto, marinated, tempura, breaded, gravy, sauce, bisque. Even when ordering "grilled" steak or fish, one has to specify "no butter or seasoning." Not realizing that the actual weight of a single-serving food product can be as much 40-50% more than the "net weight" (the minimum legal weight the product must weigh) stated on the label. So, for example, a muffin might show a net weight of 4 oz. but could weigh 5 oz. – some 25% more. The problem is that the nutritional data on the label is usually calculated on the lesser net weight. Large differences are commonly found with baked foods and snacks. It pays to check the weight and allow for the extra calories. Not counting the salad dressing poured onto salads. Just 2 oz. of Caesar or Ranch dressing can add some 300 calories to that healthy low-calorie salad. Request the dressing on the side or better still, request a low-fat, low-calorie dressing. During the summer, I’ve got a relatively low cooking (that requires heat) threshold in the house. We eat a lot of salads. We eat a ton of sandwiches. It’s simply too hot to heat up the kitchen with an oven and stove going, therefore anything hot prepared at our house in the summer either comes off the grill or out of the Crock-Pot. The low-maintenance prep means that we have a little more time to spend in the grocery. Another change: Usually I buy groceries in huge volume, but summer’s schedule has us making fewer trips where we just dash in for one or two things we’re going to eat that night. Somehow, the grocery bill doesn’t seem so monumental when it’s broken down into smaller increments. Although one of these days I’m going to walk out of there spending less than $20, and I’ll keel over in the parking lot. This past Sunday saw us with lots of time on our hands. Dad was in New York, so the three of us tooled around town doing a great job of doing nothing. We swung by the Golden Springs Winn-Dixie (still in the middle of its facelift) and strolled through the produce section. Lots of stuff caught the eyes of my littlest shoppers. They lingered at all the vegetables they’d seen on TV that are now available on a regular basis. And, once baseball winds down, we’ll be cooking with frequently. In the end, they grabbed a big bowl of fruit, already cut up. While I tried to convince them of the savings that would come about by buying all the elements and then cutting them up ourselves, they weren’t having it. Sure enough, they sat down, the bowl between them, grabbed two forks and jumped right in. The Consulate General of France and the Southern Food and Beverage Museum present The Art of Tasting, a gourmet dinner presented at the Mélange restaurant in The Ritz-Carlton Hotel in New Orleans, Thursday June 19, 2008. This culinary event features a specially paired menu with wines selected by Jacques Puisais, founder of the "Institut du Goût" (Taste Institute) in Paris, in collaboration with Mathew Murphy, Chef of The Ritz-Carlton. The dinner, presented as a theater performance by Jacques Puisais, renowned as the James Beard of France, will explore the relationship between the senses and food. Mixing his scientific knowledge with his poetic sensibility, he has created a "philosophy of taste." Jacques Puisais has traveled the world, teaching his philosophy of appreciating the simple pleasures of taste. The dinner costs $125 and is given in support of the Southern Food and Beverage Museum, the Riverwalk, New Orleans. Keep those yeast rolls coming, and pass the mac 'n cheese. Kids at 41 O’Charley’s Restaurant locations will be rewarded with special prizes when they dine at the restaurants today through Aug. 31. Kids who eat at one of the designated O’Charley’s restaurants in Alabama, Georgia, North Carolina, South Carolina and Virginia during the three-month period will receive a bookmark/frequency card with their first meal. The bookmark recommends summertime reading ideas for kids ages five through 10. The frequency card is pre-stamped with one stamp so the kids only need to collect three additional stamps to receive a book. At each subsequent meal they eat at O’Charley’s, a team member will stamp the bookmark. After three meals, the kids will receive a free kids meal coupon and they can mail in their stamped frequency card to receive their choice of one of five of the highly popular Everything Kids books, including: Everything Kids Cookbook, Everything Kids Baseball Book, Everything Kids Princess Book, Everything Kids Science Experiment Book and Everything Kids Mazes Book. Guests who mail in their completed frequency card will receive a coupon for a free kids Chicken O’Tenders meal with their book and are automatically entered in a sweepstakes that will award one Grand Prize of an Orlando Theme Park Vacation for four and a $50 O’Charley’s gift card. Kids have a choice of nine meals on their menu. Entrees range from macaroni & cheese & a side item for $2.99 to a 5-oz. steak & a side item for $5.99. Side items range from fruit cup to smashed potatoes. 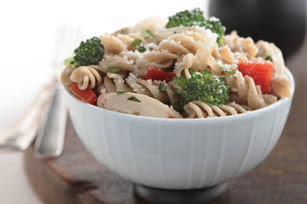 Here's the finished dish on What's Cooking Tonight: the chicken and pasta recipe with broccoli and other vegetables just bursting with flavor. The fusili pasta holds the sauce nicely, but you could also serve this with pasta shells or even macaroni, if you happen to have some taking up space in the pantry. Cod is extremely affordable, as well as being friendly to the American palate that shies away from distinctively flavored fish. It's got a light flavor, needs a light touch in the kitchen, and is underappreciated. This recipe calls for fresh fennel. Fennel has made its way into our area markets, now, and the vegetable that looks like a cross between dill and cabbage has a flavor that can be imitated by no other ingredient. 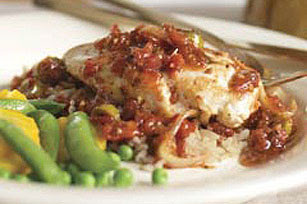 This recipe will work with halibut, whitefish or swordfish. Just stay away from catfish, which could pick a fight with the fennel that you may not want to taste. Rinse the fish in cold water and pat it dry with a paper towel. Trim the fennel, keeping the narrow top stems and some of the feathery leaves. Cut the bulb in half lengthwise and remove the core (toss the core). Cut it into matchstick pieces, similar to the carrots. Spray a skillet with some cooking spray and add the vegetables. Cook over medium-high heat about a minute. Stir in 1/4 cup of the apple juice and half the salt. Cook 2 more minutes. 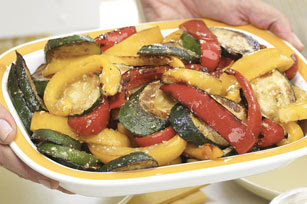 Add some pepper, then set the vegetables aside on a dish to keep warm. In the same skillet, add the fennel stems and leaves and the remaining apple juice. Bring to a simmer, then turn the heat to low and add the fish. Cook, turning once, about 5 minutes. Sprinkle with the remaining salt. Serve the fish (without the fennel stems and leaves) hot, with the vegetables. Per serving: 202 calories, 1.5 grams of fat. Here at The Star, we'll pretty much cook with anything. (You may remember our great canned meat experiment: Trash Meat Tuesday....) Beer and brats is among our favorites. Now the question will be what else can beer be used to cook with. I put it in my chili, and I poured a porter someone had left at our house into beef stew one time. As a cooking ingredient, it's pretty versatile and, by reading Pitcher This, I've come to see just how many different beers and beer personalities there are out there. The folks from the National Beer Wholesalers Association have passed along some recipes they feel would be good for Fourth of July. Spinach Salad with Bock Beer Vinaigrette looks to be easy to prepare and present as part of a picnic buffet. Whisk a vinaigrette dressing by combining Bock Beer with rice vinegar, honey, Dijon mustard, chopped tarragon and an extra-virgin olive oil. Marinate sliced peaches and chopped red onion briefly in the mixture, then add baby spinach leaves, toasted pecans, chopped hard boiled egg and crumbled blue cheese to the salad. This recipe serves four for an easy weeknight meal, but it can be doubled or even tripled easily to serve a crowd. 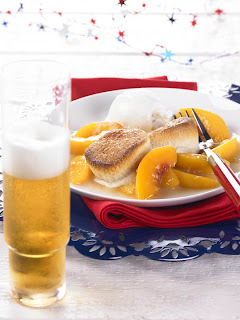 For a delicious dessert, serve Wheat Beer Peach Cobbler (above). Pitcher This columnist Ben Cunningham recommends Leinenkugel Honey Weiss to prepare this dish. This recipe makes the preparation simple by calling for frozen bagged peaches, but if time for peeling allows, substitute with fresh fruit. Start by boiling a bottle of fruit or honey-flavored Wheat Beer down to a thick reduction. Stir in sugar, light brown sugar, cornstarch, Chinese five-spice powder and the peaches; boil until hot and cooked through. Pour into a large serving dish and top with refrigerator buttermilk biscuits. Bake just 15 minutes and cool slightly before serving with vanilla ice cream. A crispy, fruit Lambic Beer would be a perfect accompaniment to this dessert. Pour Honey Wheat Beer into soup pot or other large pot; bring to a boil over medium heat. Boil 5 minutes, or until reduced to ¾ cup. Turn off heat and let reduction cool completely. With butter, generously grease a 3-quart baking dish (9 ½ x 11 inches). Preheat oven to 450 F.
Add ¾ cup sugar, light brown sugar, cornstarch and five-spice powder to beer reduction; stir until sugars dissolve. Stir in frozen peaches and toss. Bring mixture to a boil; reduce to medium-low heat. Simmer mixture about 8 minutes, tossing peaches several times, until juices thicken and peaches are hot. Pour mixture into prepared baking dish. Arrange 20 biscuits on top of hot peach mixture. Brush tops of biscuits with milk; sprinkle with additional sugar. Bake in oven 15 minutes, or until biscuits are puffed and golden brown and peach mixture is bubbling. Cool on wire rack 15 minutes before serving. Pour 1/3 cup of vinaigrette dressing into a large salad bowl. Add peaches and red onion; let stand for 5 minutes, tossing once. Add spinach and pecans; toss well. Top with egg slices; sprinkle with blue cheese. We get a lot of products through here to review -- lots of them from frequent flyers in the food world. Many times a company says they're retooling a product . It's ballyhooed as "new and improved" and all that, but then nothing comes to pass when you actually taste it. This isn't the case with Kraft's new salad dressing line. (Our family favorite: Green Goddess -- a blowback from the 1970s that is as well done in this bottle as I've ever made it.) The flavors are fresh and worth any uptick in cost. Seriously. This stuff could pass for homemade. And the new bottle design is easy to hold -- even for a 5-year-old. And, although folks have been using salad dressings as marinades for years, I admit I've been late coming to that party. However, some simply home-cooked meals can benefit greatly with a bit of gussying up. COOK rice as directed on package. MEANWHILE, heat large nonstick skillet sprayed with cooking spray on medium heat. Add chicken and onions; sprinkle with oregano. Cook chicken 3 min. on each side or until chicken is lightly browned on both sides and onions are crisp-tender. Add tomatoes, dressing and garlic; stir gently. Continue to cook 4 to 6 min. or until chicken is cooked through (165ºF), turning chicken after 3 min. Stir in olives. SPOON rice onto serving platter; top with the chicken and sauce. PREHEAT grill to medium heat. Place vegetables in grill basket. GRILL 10 min. or until crisp-tender, turning occasionally. Place in large bowl. ADD dressing; toss to coat. Sprinkle with cheese. Mama, mia, that's a spicy (and big) meatball. Meatballs are a joy to eat -- and they can be fun to make -- but if you've ever tried to make a jumbo-sized meatball, you know how difficult the endeavor is. They fall apart. They don't get cooked all the way through, the result is a series of individual meat loaf servings. They taste OK, assuming they're cooked, but they ain't meatballs. Here's a product that came our way the other day: Jumbo meatballs ordered online. Slow roasted for six hours for an authentic old-world Italian flavor, Mama Mancini Meatballs in Sunday Sauce. 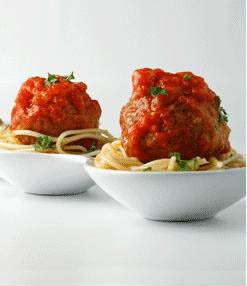 The meatballs are jumbo sized and are terrific paired with favorite pasta, or even on their own. Mama Mancini Meatballs and Sunday Sauce were developed and created by Dan Mancini from an authentic recipe that has been in his family for generations. The recipe owes its traditional Italian flavor to Dan's grandma, Ann Mancini, who immigrated to the United States through Ellis Island in 1921. "Out of respect for every grandmother, I say 'These meatballs and Sunday Sauce may not be the same as your Grandmother's, but they are made with the same love,'" said Daniel Mancini. Mancini noted, "Sunday dinner at Grandma's house was always pasta and meatballs. Big, saucy meatballs that filled you up and made you feel good inside." Mama Mancini's Famous Meatballs and Sunday Sauce are available online for $39.90 per dozen meatballs. Considering how much meat is in one, that's probably not a bad price. The meatballs are shipped frozen anywhere in the United States and take 20-30 minutes in the oven to heat up. Where are those 'maters from?